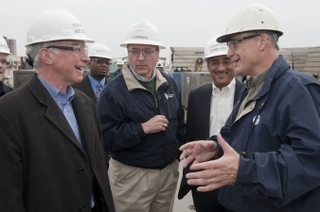 NEWPORT NEWS, Va., Feb. 10, 2012 (GLOBE NEWSWIRE) -- Huntington Ingalls Industries (NYSE:HII) today hosted a visit by U.S. Reps. Joe Courtney (D-Conn.) and Robert C. Scott (D-Va.) at the company's Newport News Shipbuilding (NNS) division. The congressmen met with shipbuilders during tours of the aircraft carrier Gerald R. Ford (CVN 78), which is currently under construction, the aircraft carrier USS Theodore Roosevelt (CVN 71), which is undergoing its mid-life refueling and complex overhaul (RCOH), and Newport News' submarine construction facilities. They also observed a demonstration of the virtual design tool being used to design Ford-class carriers. "It's important that our country's decision-makers see the pride and precision that go into our products," said NNS President Matt Mulherin. "Both congressmen have lent tremendous support to shipbuilding, and we appreciate their continued efforts." As a member of the House Armed Services Committee (HASC), Courtney serves on the Seapower and Projection Forces and the Military Readiness subcommittees. He co-chairs the Congressional Shipbuilding Caucus with Rep. Rob Wittman (R-Va.) and played an instrumental role in securing funding for the Virginia-class submarine program's two-submarines-per-year build plan. "Thank you to Congressman Bobby Scott for taking the time today to host me at the Newport News shipyard," Courtney said. "As a member of the House Armed Services Committee's Seapower Subcommittee and the co-chairman of the Congressional Shipbuilding Caucus, I appreciate the opportunity to see the work being done in Virginia in support of the Navy. The submarines being built here and in Groton, Conn., are critical to our national security as the Pentagon shifts to a leaner, more agile force focused increasingly on the Pacific." Among the committees on which Rep. Scott serves is the Committee on the Judiciary, where he is the ranking member of the Subcommittee on Crime, Terrorism and Homeland Security and a member of the Subcommittee on the Constitution. "Newport News Shipbuilding and the men and women who work here are one of our nation's most critical national security assets," Scott said. "I was honored to have the opportunity to help show my friend and colleague, Congressman Joe Courtney, around the shipyard. As co-chair of the Congressional Shipbuilding Caucus, Congressman Courtney is a strong leader and advocate for shipbuilding. I look forward to continuing to work with Congressman Courtney to ensure that shipbuilding remains one of our top defense priorities."